Just tested the Magnemaze prototype on an original Kindle Fire and it worked extremely well, maybe we'll consider putting it on the Amazon Store if possible. Magnemaze is on the way! Been wondering what Shower Thoughts has been doing? Well the answer is below! We've been working on Magnemaze! 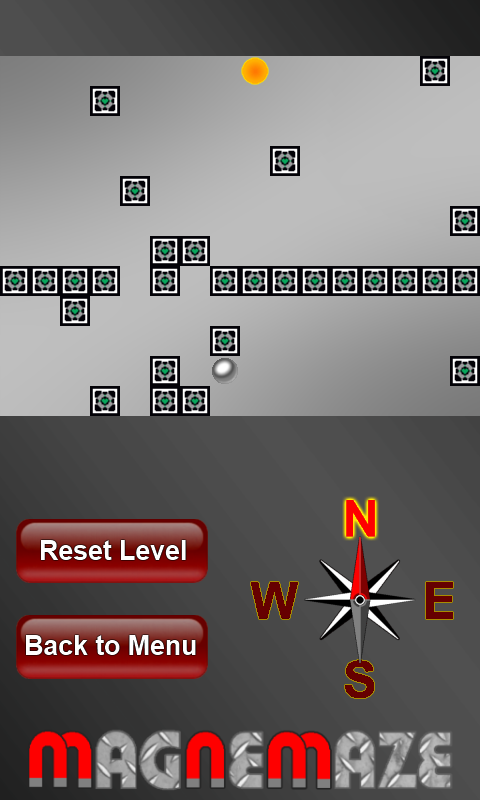 These are mostly stand-in graphics but there is a new alpha Android port that is working great with the new mechanics. 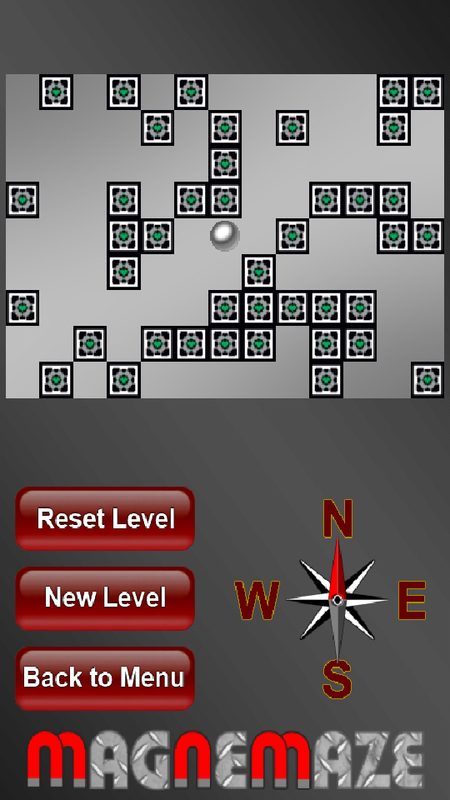 The level depicted below is very early in the game, so if you think it looks too easy just wait until you play the full game to get a sense of the true Magnemaze experience. The new build of the obj_char demo is now available on the obj_char page of this blog for download! This is most likely going to be the last build released before the graphics are redone. In other words, this will probably be the public build for at least a couple weeks, if not longer. But it also means that awesome new graphics are on the way! Below is the changelog for Version 0.08, please contact us if you find any collision bugs still! Keep filling out the survey, subscribe to the mailing list, like us on Facebook, follow us on Twitter, and thanks for your continuous support! It turns out that in the build released early this morning (version 0.07), there was a minor compile time bug where the boss music was not playing correctly. Thus, we have now updated the download link to version 0.07.1 which has fixed the problem. Feel free to delete the old build and use this one seeing as it's otherwise identical apart from the version name modification and the music fix. Click the "obj_char" tab at the top of the page to get to the download link. We just released a new update for the obj_char beta demo. The changes are listed below. As always, please feel free to give feedback via the survey, subscribe to the mailing list, like us on Facebook, and follow us on Twitter. If you're a Stevens student or friends with one, be sure to come to the C2GS Epic Lan tonight at 9:00 pm where we'll have obj_char laptops set up for play testing. Why not just download it and play it in your room? Because tonight we will be specifically testing different music samples that could possibly appear in the next build of the game! Currently, we have three new tracks competing to be the main track of the next build plus one new challenger to replace the old boss track. Come tonight to help decide! Lastly, come tonight and be the first to play the new build which features a number of bug fixes, minor game adjustments, AND more comfortable keyboard controls.